Bad News for Russia’s Naval Ambitions? Today, RT reported that a fire broke out on a nuclear-powered submarine at the Zvezdochka ship repair center in the Arkhangelsk region in Northern Russia. The incident occurred aboard the K-266 Oryol, an Oscar II-class nuclear-powered attack submarine (SSGN), which is part of Russia’s Northern Fleet. According to a spokesperson of the Zvezdochka dockyards, no weapons were on board when the fire broke out. “The nuclear fuel from the ‘Orel’ was unloaded when the submarine arrived for maintenance to the dry dock. The reactor has been shut down. No workers or members of the crew were harmed during the fire,” Ilya Zhitomirsky, the spokesperson emphasized. The fire allegedly started in a compartment close to the ship’s tern. Sputnik News notes that according to preliminary information from a law enforcement source, the fire was caused by welding operations. RT reports that welding operations were also the cause of a fire aboard the Delta-IV-class SSBN Yekaterinburg in December 2011. The Oryol has been serving in Russia’s Northern Fleet for the past 21 years. In 2013, it was transported to the shipyard for a general overhaul, which was scheduled to be completed in 2016. As of now, it remains unclear how much damage the fire caused and in what way it will postpone the Oryol’s return to active duty. As I reported two weeks ago, the Russian Navy is in the middle of an ambitious naval modernization program (see: “Russia to Upgrade 10 Nuclear Submarines by 2020”). 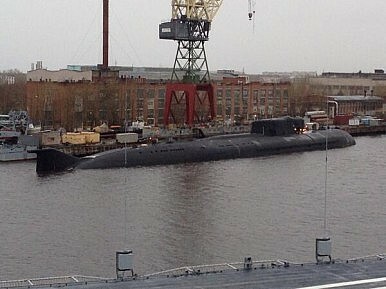 In March, Russian Admiral Vladimir Chirkov, the navy’s commander-in-chief, announced that ten project 971 SSN Akula-class and project 949A SSGN Oscar II-class nuclear-powered submarines will be upgraded in the Zvezdochka shipyard in the northwest and in the Zvezda docks in Russia’s Far East. The upgrades are supposed to expand the subs’ lifespan for another 15-20 years. Between 40 to 70 percent of Russian submarines are currently estimated to not be operational. The K-141 Kursk, which sank in August 2000 killing all on board, also belonged to the Oscar II-class. One of the reasons for the modernization of the Soviet-era Oscar II-class submarines are delays in the project 885 Yasen-class SSGN program and the exorbitant costs of the new submarine. This class of Russian attack submarines was supposed to replace older Soviet-era multi-purpose nuclear submarine models by 2020. The fire could be a further confirmation what many experts have noted in the past: Russia’s shipbuilding industry will not be able to keep up with Vladimir Putin’s aggressive 2020 naval procurement program. Indeed, some analysts estimate that Russian shipyards will only be capable of producing 50 to 70 percent of the weapons and equipment laid out in the plan over the next five years.